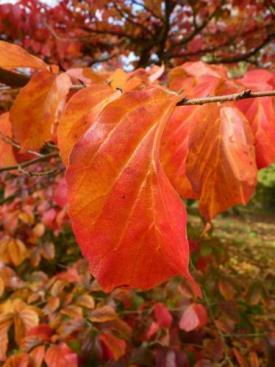 25/10/2018 I tend to suffer from maple envy in autumn when I look above the ugly, half-bare conifer hedge towards my neighbours’ garden, and see the top of their bright red maple tree, which was yellow not long ago. This year it got me thinking. 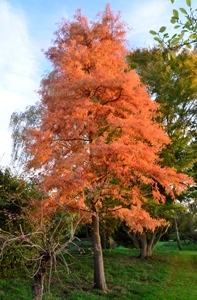 My dad and my brother planted plenty of maple trees in my garden, so where are all the autumn colours? The two maples by the tennis court are lovely in autumn, but they are so large now that standing under them and looking upwards seems to be the best way to appreciate the leaves. It’s not the same as having a close-up view from the sunlit side. So I took a walk round the garden, and realised I’d been envying my neighbours’ tree without justification. Out of sight of the house, opposite my vegetable beds, was the same species of maple (I believe) as theirs, with just as striking a canopy. It is a shame it is not in a more prominent position. I looked around for other colourful trees. Along the cherry avenue, the leaf display was on the ground, not in the branches; but this was no disappointment. There were all shades from cream to dark red. I am reluctant now to mow the path, knowing that I will spoil the work of art. 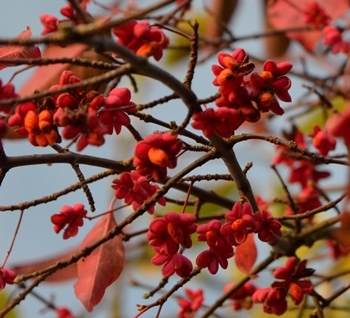 The spindle – so called, I have just learnt, because its hard stems were once used to make weaving spindles – had all its colours in situ: orange seeds within raspberry-pink capsules clashing with fiery red leaves. In any other context the colours would seem garish, but the fact they exist naturally side by side on a living plant makes them a singular and spirit-lifting autumn sight. This large shrub is now being squashed by an endlessly growing magnolia, but I cannot bring myself to remove it – or the magnolia, which is an early spring delight. 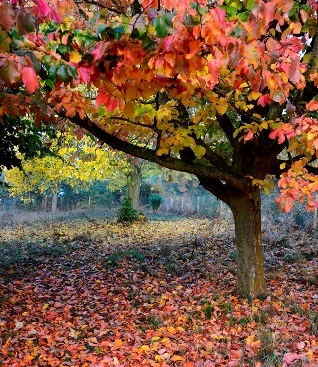 In the wildflower meadow, however, are the undisputed autumn queens: two Persian ironwood trees. They are so different from each other that you might not realise they were the same species. I am sure they are not the same cultivar. 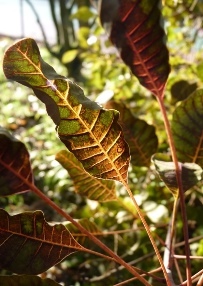 One grows upwards, and is amongst the first trees in the garden to start losing its leaves; the other grows like an umbrella, and still retains its leaves when its taller sibling is almost bare. 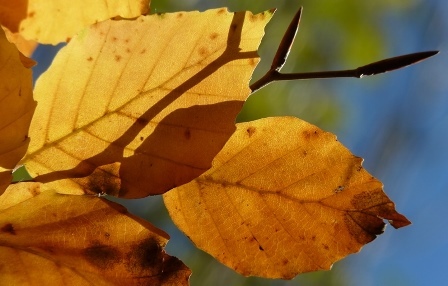 What they both have in common, though at different times, is their remarkable autumn display. 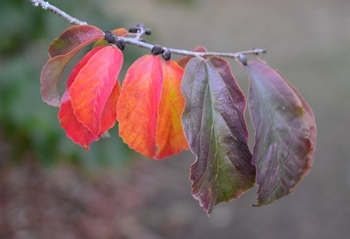 The leaves at the tips of the branches turn first, giving a graduation in colour from tip to base that reminds me of children’s ice lollies. 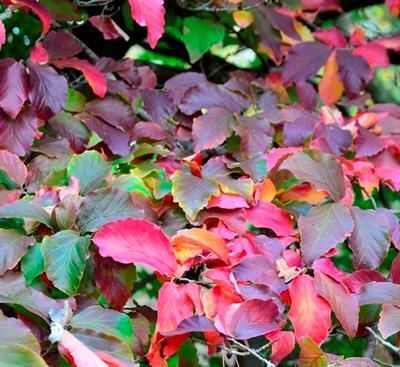 The predominant red on the sprawling tree is not a maple-red, but a deep purple-red. I cannot take my eyes off it. For some reason I assumed my brother and father had planted these trees before I was born; perhaps because they are unusual, and native to Iran (as their name suggests), like my mother. But I had to ask my brother to find out for sure, and he told me that the previous owners of the house planted them. Despite their seasonal magnificence, they are apparently quite rare in gardens, and are more likely to be found in arboretums. 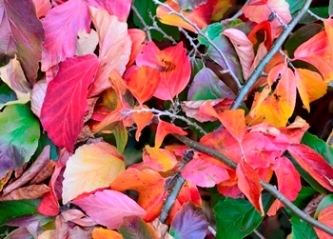 This year I suddenly feel the need to add more autumn interest to my garden, especially some that is easily visible from the house. Planting trees (and especially shrubs) is far from straightforward these days, with goats around to thwart my efforts, so it will require careful thought. But I also know I must spend more time appreciating what I already have.